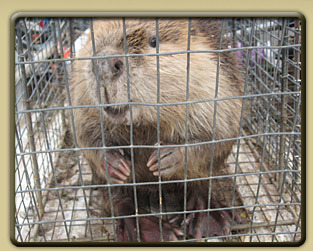 Beaver and Muskrat control and removal should be initiated as soon as the animal has been discovered living in an area. Beavers and Muskrats also carry rabies. This disease can be transmitted to humans and to your pets. People who understand the danger these animals can present, should only attempt Beaver and Muskrat control and removal. Cages by Jim understands the danger and has the tools and training to safely remove these very strong animals. Beaver/Muskrat \ ' be-ver\ Keystone species with flat tails and lustrous fur, beavers reliably and economically maintain wetlands that can sponge up floodwaters. \ ' m?sk- , rat\ May be considered rats (one of the larger “rats”) in that they are medium-sized rodents with an adaptable lifestyle and an omnivorous diet. Beavers mate when they are about 3 years old. They mate for life, but if one mate dies, the other one will find another mate. Mating months are January to February and gestation lasts about 3 months. Females have 1 litter of kits (young) a year, between April and June. The young beavers are weaned in about 2 weeks and can live to be 20 years old. The muskrat is found from northern North America south to the Mexican border. In the southern part of its range, the muskrat may breed year-round. In the northern parts of it range, mating season runs from March through August. The female muskrat may have up to 5 litters a year and gives birth to 2 to 9 young. They mate when they are about a year old, with the average lifespan of 3 to 4 years.